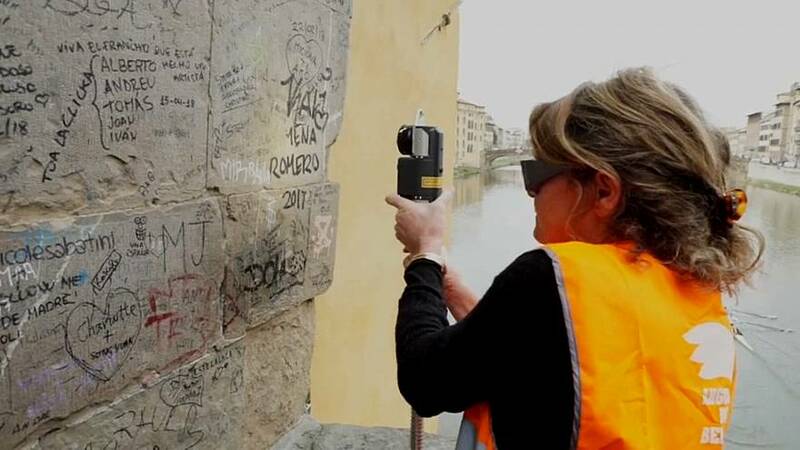 Lasers are being used to remove graffiti from historic buildings in Italy without damaging their fragile surfaces. Generations of visitors to cities such as Florence are among those to have left their mark. But this unwanted legacy is being erased thanks to lasers wielded by a team of volunteers nicknamed Angels of Beauty. For visitors to Italian cities, the sense of being in an open-air museum is part of the draw, but this unencumbered access to architectural treasures often comes at their peril, with many facades being defaced by graffiti. Tuscan company El.En. Group has designed a special laser that can remove graffiti without damaging the surfaces being cleaned. The company has donated the tool to an organisation of volunteers, called "Fondazione Angeli del Bello Onlus" (Non-Profit Angels of Beauty). Its aim is to clean and preserve Italy's cultural heritage. El.En. has trained restorer Daniela Valentini in how the laser should be used. Valentini said: "When used properly, the laser doesn't damage the surface on which we intervene. (We can use the laser) for cleaning, as in this case, for removing a vandal's writing. The laser is also used to clean architectonic surfaces, therefore church facades, and also sculptures." El.En. director Paolo Salvadeo explains: "The laser used by Angeli del Bello (Angels of Beauty), the one we donated to them, is called Laser Blaster, is the latest generation laser and it is an optical fibre laser. "We have other lasers that are used on polychromatic surfaces, plaster or antique jewellery or marble, and we can select the best way to apply it and the best result according to the wavelength." These lasers cost €40-70,000 and have been used on European monuments including the Leaning Tower of Pisa, Venice's Rialto Bridge, Cologne Cathedral and the Palace of Versailles.